Actually, a lot of restaurants are concentrated in Tokyo, so you won’t be able to decide which food is the best that you should eat. Chankonabe, this is a hot pot dish eaten mainly by professional Sumo Wrestlers, is the one of the best foods to eat in Tokyo. Just because this food is for Sumo wrestler does not mean it is pretty big. No worries, they should be able to serve an appropriate size hot pot just for you. As you know, this is the second largest city in Japan. Osaka has a lot of unique foods in comparison with Tokyo. Kushikatsu, this is pieces of something such as beef, seafood, vegetable and Tofu deep-fried on a skewer, is one of the best foods in Osaka. If you eat Kushikatsu you will probably see a poster with the words, “ Don’t dip food in the second time”, displayed in the shop. This is a Kushikatsu rule that nobody can break. If you disobey this instruction you may need to get out of the restaurant (haha) because you will contaminate the communal oil with germs. Make sure you obey this instruction. As you know, Kyoto is the most traditional city in Japan. There is a lot of traditional architecture, but Kyoto isn’t just about temples, its food is also awesome. Warabimochi, a Japanese jelly-like confection made from bracken starch, is one of the best desserts in Kyoto. We usually enjoy it with Kinako, sweet roasted soybean flour, or brown sugar syrup, but now there are various ways to enjoy it. Let’s explore new tastes and give it a try. This city is located in the most north part of Japan. This city is famous for being the cold city in Japan. This cold weather is the reason why seafood is so good. 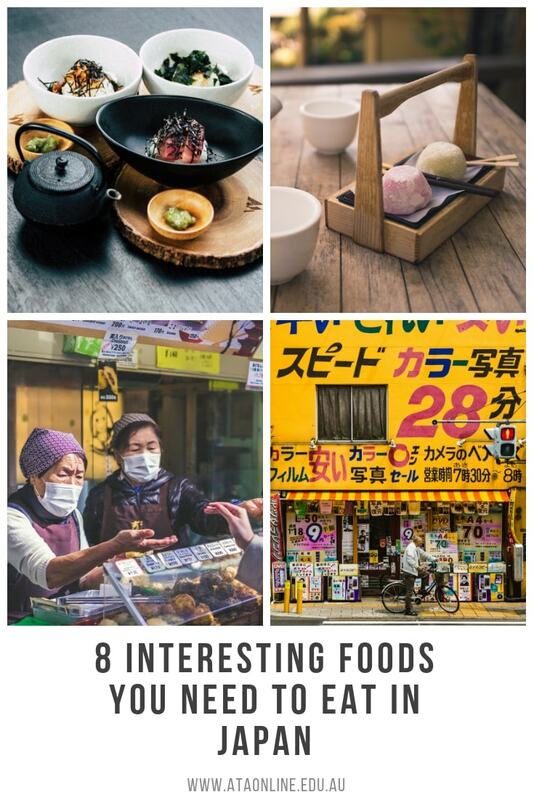 Of course, there are other awesome foods in this city, that is why Hokkaido is called the treasure chest of food in Japan. As I said, this city is famous for the seafood, especially crab. There are different kinds of ways to cook in Japan such as, crab sashimi, crab hot pot, crab shabu-shabu, grilled crab and so forth. All of this seafood is brilliant. For roughly $2, you can score a piping hot and deliciously addictive curry bun (kari pan) at many bakeries and convenience stores around Japan. If you need a quick fix, pop into a 7 Eleven or Lawsons for your fix. But if you are looking for a true culinary experience, that will only cost you a couple of bucks, head over to some of the famous bakeries like Cattlea, Asakusa Tomifuku, and Artisan Boulanger Kinmugi. What is a curry bun? A curry bun is a doughy bun filled with Japanese curry sauce, which is a bit sweeter and has a distinctive taste that is quite different from other curries, that is coated in bread crumbs and deep fried. This handheld treat is a meal in itself and the combination of sweet, savoury, and meaty flavours makes it addictively delicious. If you visit Hakone in Japan, you will see queues of locals and tourist waiting for bags of black eggs. At first glance, you would think that they were waiting for a lucky object to be presented to the Gods. But no, these eggs were made for eating. Plus, they make you look adventurous on your Instagram feed. Double win! What does a sulphuric egg taste like? Despite their demonic colour, sulphuric eggs actually taste like normal hard-boiled eggs. They are not dangerous to eat and you will only taste a slight sulphuric taste if you have a sensitive palate. When you are on the streets of Japan, you will see a lot of vendors selling these fish-shaped treats. At first glance, you would think that they are a savoury, fish flavoured treat, but as appetising as that sounds, Taiyaki are actually sweet. All around the world, vendors are creating more elaborate kinds of Taiyaki, so you will find taiyaki with all sorts of fillings, from the traditional red bean to matcha to icecream sundae filled versions. Taiyaki is a snack found in Japan. It is like a filled waffle in the shape of fish. You can get so many different kinds of fillings including sweet and savoury kinds. The most traditional is the red bean filling which is sweet and earthy. I really didn’t want to add this one because it is probably my least favourite Japanese food of all time. But natto has a mixed reputation, you either love it or hate it with a passion. As you can tell, I am the latter. Natto is commonly served with plain rice and is eaten as a breakfast food. As it is essentially fermented beans, the health benefits for your gut are amazing. What does natto taste like? So for me, the taste of natto isn’t the worst part. It has a distinct smell and taste that can’t be described unless you try it yourself, sort of salty, sort of sour, and sort of musky. For me, the worst part is the texture. It’s slimy and saliva-like consistency doesn’t sit well in my mouth. But in saying that I have foreign friends who love natto and eat it every day. As I like to say, never say you don’t like something unless you try it first!